Posted by admin in Alaska, Kasatochi. 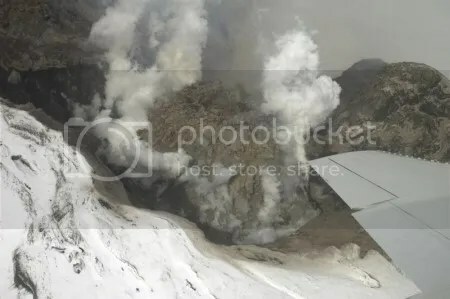 Life is already returning to the island of Kasatochi in the Aleutians, blanketed with ash and left bleak and barren by the surprise eruption of its eponymous volcano in August 2008. A scientific team is revisiting the island to look at how it is responding to the eruption, the Anchorage Daily News is running a series of reports on their work, written by University of Alaska Geophysical Institute Science Writer Ned Rozell. The latest report describes the way in which life is ‘inching its way back to Kasatochi’. The birds are gone and ash outwash from the island is disrupting kelp growth in the surrounding ocean, but nineteen species of plant have been found springing back to life on the island, along with an insect or two and some tough invertebrates: ‘The smallest and luckiest of life forms clung to natural bunkers within the island, and mats of plant roots were buried quickly enough to withstand the heat of the eruption flows’. Posted by admin in activity reports, Alaska, Augustine, United States. 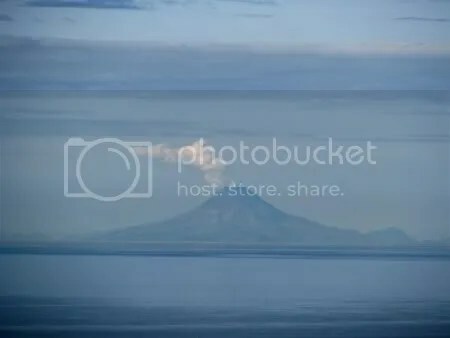 Augustine Volcano, Alaska, has been releasing a prominent steam plume from its summit over recent days. The Alaska Volcano Observatory has released a brief news announcement which says that this plume represents normal behaviour for Augustine and is nothing to worry about: it has just been more visible over recent days because of ‘humidity levels and atmospheric conditions’. Augustine’s largest historic eruption was a VEI=4 event in 1883-4 (see ‘Mount Augustine split in two’), and its most recent eruption (VEI=3) was in 2005-6. The AVO keeps a close watch on Augustine and will respond appropriately should the volcano show signs of renewed activity – that’s what volcano monitoring is all about. In the meantime we have an excuse for reproducing this very nice picture, taken from Diamond Ridge near Homer, Alaska, on 25 August 2009, showing the steam plume very clearly, along with Augustine’s beautiful symmetrical profile. The image, which is available from the AVO website, is courtesy Dennis Anderson, Night Trax Photography. Posted by admin in activity reports, Alaska, United States, Veniaminof. Over the past day [i.e. 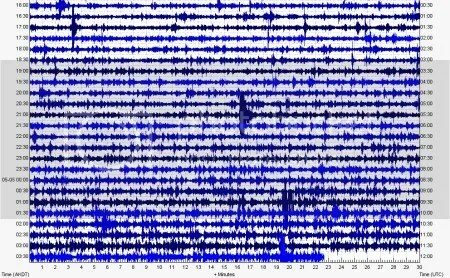 7 May 2009], earthquake activity has increased at Mount Veniaminof volcano. This increase is a significant change from normal background activity … Currently the earthquakes are small in magnitude but are registering across the entire seismic network. Seismicity rates are high and have varied between 5-10 earthquakes per hour during quieter periods to 1-3 earthquakes per minute during more intense activity. The summit crater is producing steam, in line with its habitual practice, and no ash emissions have been detected. The last large eruption of Veniaminof was a VEI=3 event in 1983. Otherwise its eruptive history is characterized by relatively small eruptions (VEI=1 and 2) on a fairly frequent basis: the most recent was in February 2008. Another Alaskan volcano to keep an eye on.